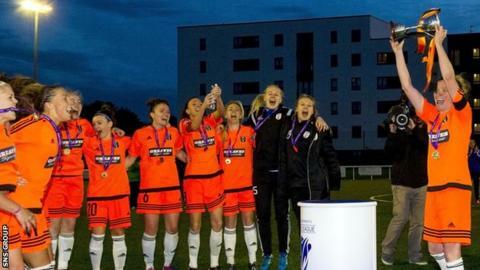 Leanne Ross scored a hat-trick as League Cup holders Glasgow City strolled into the semi-finals with the 10-0 demolition of Glasgow Girls. Last season's beaten finalists Hibernian also enjoyed a comfortable afternoon, winning 6-0 at Forfar. Aberdeen turned in a great display to beat early SWPL leaders Spartans 5-1, with Rachael Small scoring twice. And Rangers make up the final four, scoring two late goals in a 5-0 triumph over Buchan.